*“I’m glad I’m taping this. He’s not supposed to be doing that. He’s not supposed to be putting his hands on him,” says a female bystander watching and recording a white officer as he chokes a young Black man before throwing him to the ground. From the sound of her voice she may be white. From the sense of her humanity, she appears to be disgusted. From the frequency of these incidents alone, police officers don’t give one damn whether they are being filmed or not. They obviously feel free to let the Adrenalin of their anger and rage against Black people reign free and unbridled. In other words, they don’t giving a flying F*** because they know their actions will ultimately be excused. 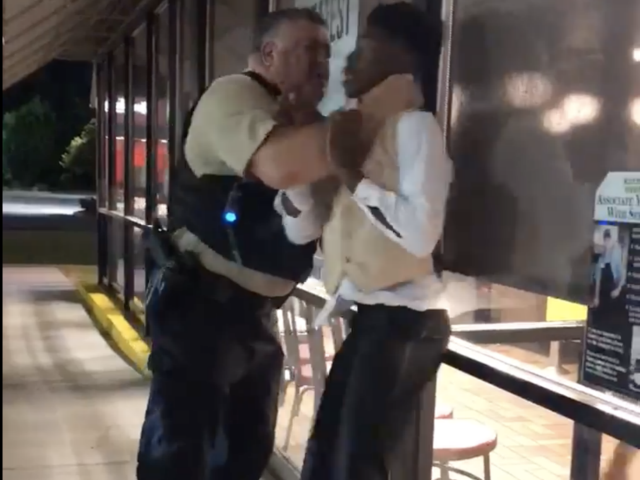 This incident reportedly came about in front of a waffle house. The young man, Anthony Wall, had taken his 16-year-old sister out for a bite following prom. He reportedly got into an argument with the restaurant employees, police were called, and that, he tells ABC11, is when things got ugly. In the video (scroll down) you can see Wall being held against a wall by the throat. He continuously screams “Get your hands off me,” to the officer, who is wearing a tactical vest . “I was pretty much trying to scream for air and trying to breathe because he was holding my throat and that’s when I got aggressive with him because you are choking me,” Wall tells the media. After all was said and done, Wall was charged with resisting arrest and disorderly conduct. No details on exactly what occurred in the restaurant that was so bad police had to be called. According to the ABC11 report, Wall took full responsibility for his incident with the Waffle House employees, but the altercation with the police officer is a whole different story. “Your hands should have never been around my neck like that if my hands were in the air,” said Wall. Meanwhile North Carolina’s chief of police told the Raleigh News & Observer that his department was investigating the incident, as was district attorney Ernie Lee. The video got hundreds of thousands of views after it was posted. See it directly below. Be warned. It’s violent and inhumane. Police savagery at its best. So sad. And police suppose to be protecting!!! When the time comes GOD will punish this officer. NO one gets away from his wrath. Abusing his authority like that smh. I hope this kid sues them all.